Quick Takeaway: This is a fascinating read that explores the issues of nature vs. nurture using the subject matter of a mother who never wanted children and her deeply troubled child. Who Should Read This? I would absolutely recommend this book to lovers of psychology because of the “nature vs. nurture” theme. It is also very dark, so I would also recommend it to anyone looking for character-driven horror. Review: This is a brilliant book about the nature of evil. Are people born evil? Is evil a learned behavior? I don’t want to go into the details about the plot of the book because I don’t want to give anything away, but this is the type of book that is character-driven while still including a lot of plot and suspense elements. Eva is an absolutely fascinating character. I found that I could relate a lot to her, but it would not at all surprise me if others find her to be very unlikable. I have never been particularly interested in having children, and this is a major theme in the book. Are there some people who should never be parents? Are some children just born bad? As a character study, I found the character of the mother Eva to be far more interesting than the character study of the son Kevin, but the bits that focused on him were also very well-written and intriguing. Final Thoughts: This is a great book about human nature and the nature of darkness. 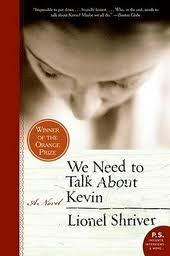 This book is not for the faint of heart, but it is sure to be a great conversation starter for a book club.